I recently wrote a blog entitled African and Asian elephants: Defining Features in order to examine the differences between two similar yet contrasting species. It seems however, that many guests struggle more so with the differentiation between the Cape or African buffalo and the Water buffalo. 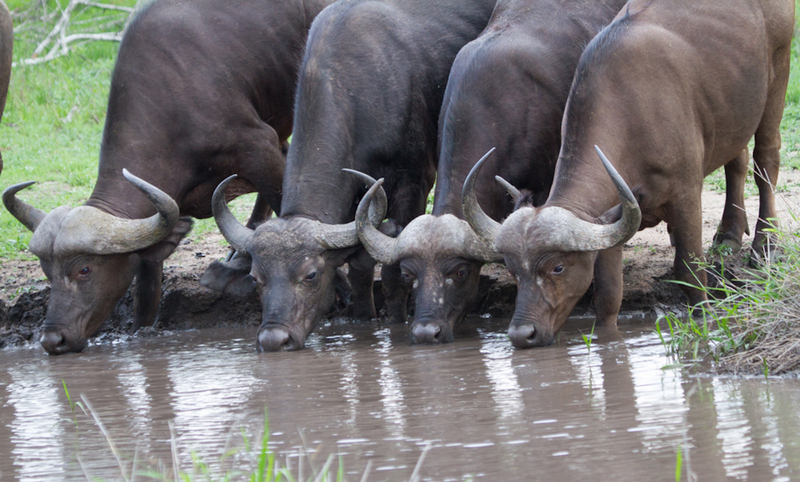 A small herd of Cape Buffalo slake their thirst in one of our shrinking waterholes. Although both part of the larger family Bovidea and subfamily Bovinae, there exists a significant difference in genus and species in the taxonomic classification which sets these two animals distinctly apart. Without getting into the often confusing and complex biological classification system, it’s important to note that there are in fact three subspecies of the African buffalo; the Cape buffalo, Syncerus caffer, the Forest buffalo, Syncerus caffer nanus and the Sudanese buffalo, Syncerus caffer brachyceros, each of which has its own separate geographical distributions and physical characteristics. The Cape Buffalo is the one we see at Londolozi, and as such will be the one we focus on today. 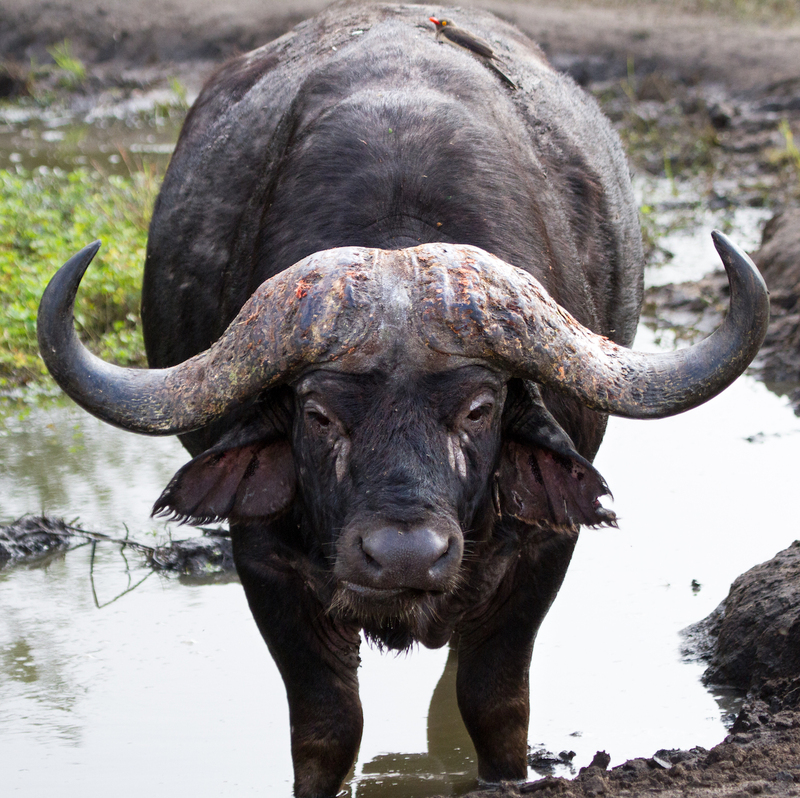 A good point of distinction occurs around the differing geographical distribution of the Cape buffalo and Water buffalo. 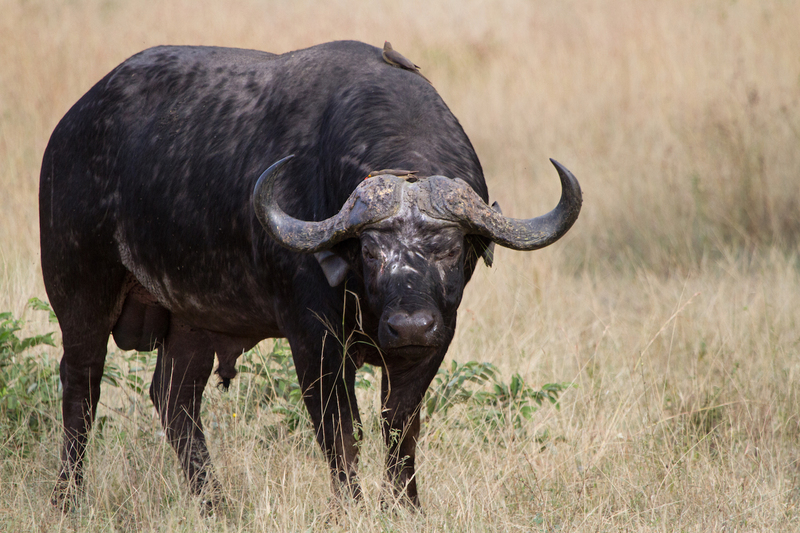 As its name suggests, the African buffalo is distributed throughout the African continent, whereas the Water buffalo is native to Asian countries. 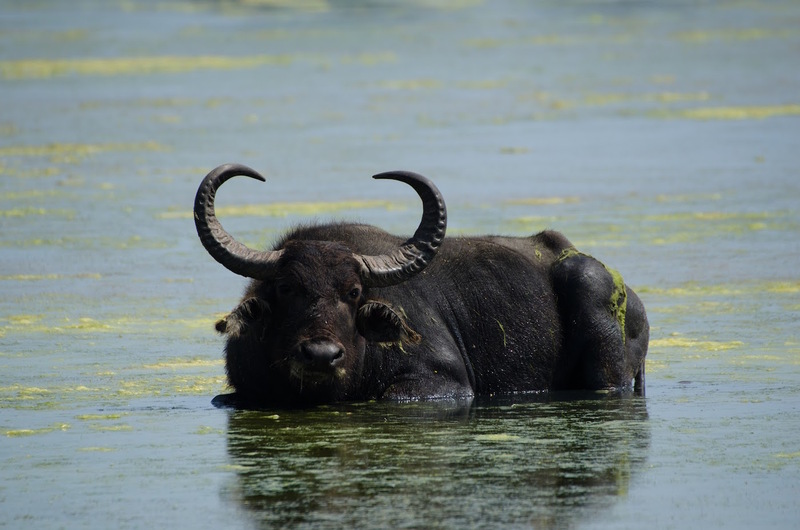 Although originally widespread throughout Asia, habitat loss and disease in the Water buffalo population has resulted in a diminished and fragmented distribution. A rough geographical distribution of the Cape buffalo (Green) and the Water buffalo (Blue). Understanding the difference between certain animals can often be achieved through their distinct geographical distributions, but leaving that aside, let’s look a bit more closely at the physical differences between the Asian and African buffalos, which in actual fact are pretty dissimilar. Similarly in stature, but slightly less in weight and size when fully grown, a Cape buffalo weighs between 500kg and 900kg with a head-to-rump length of 1m to 2m, whilst the Water buffalo weighs between 700kg and 1200kg, growing between 2.4m and 2.7m in length. Furthermore, the Water buffalo is not only larger in terms of weight and length but also in shoulder height, reaching up to 1.5m to 1.9m compared to 1m to 1.7m shoulder height of the Cape buffalo. Due to their differing habitats, the foot structure between the two buffalo species differ. Being found in much wetter conditions, the hoof of the Water buffalo is much more wide-splayed, preventing them from sinking into the softer terrestrial conditions and allowing them to lead a more aquatic way of life. By contrast, the foot structure of the Cape buffalo is more adapted to environments in which underfoot conditions are slightly harder, and although they are heavily water dependent, they don’t access or spend as much time in the water as the more adept Water buffalo do. This very relaxed old Cape buffalo bull made for some good photographic opportunities as he cautiously approached the camera. Evidently, one can see that the Water buffalo is larger than the Cape buffalo but how do they compare when assessed on mood, behaviour and social structure? Having been domesticated over 5000 years ago, the Water buffalo are often referred to as the ‘living tractor of the East’ as they provide not only a source of income, social status and food, but also as a form of transportation and ploughing. The much more aggressive Cape buffalo have yet to be domesticated (and I doubt they ever will be) due to their unpredictable and temperamental behaviour. 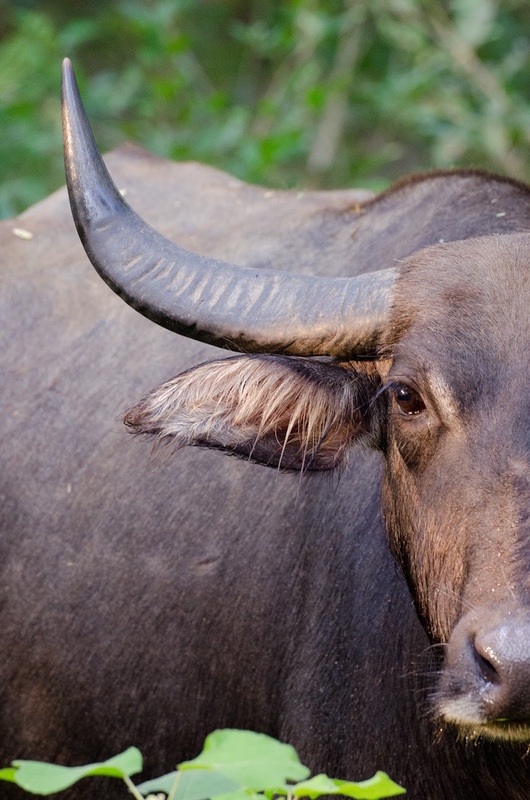 Both wild Cape and Water buffalo exhibit in very similar social structures with a large herd of younger males, females and calfs coexisting, and the older bulls becoming solitary or existing in smaller herds in their later stages of life. Both buffalo species live to between 23 and 25 years of age, although in the wilds of Africa especially, dying of old age is a luxury which few animals are afforded, and the weak and the old invariably get picked off by predators. Although this was only a brief insight into the differences between the two species, the geographical separation is the most important thing to remember about the two types of buffalo. There are no water buffalo at Londolozi, nor anywhere in Africa (at least not in the wild), so to refer to them as such would be incorrect, as well as slightly disrespectful to the African buffalo in a way; a creature with its own, fiercely deserved reputation. Thanks, Callum. Good information, well-written. Thanks a lot Callum Gowar for the good information. Welcome back! Good to read this blog from you. Thanks for the interesting facts, Callum. 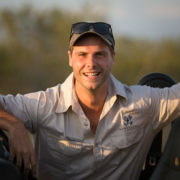 I knew nothing about this fierce animal until I spent a few days at Londolozi, and was surprised when both Mark and Lucky said they would rather take their chances with a Lion over a Cape Buffalo! After being stared down by a few big bulls (while in the Rover), I started to understand why! I love the way the herd protects each other when confronted by predators. Very well written. 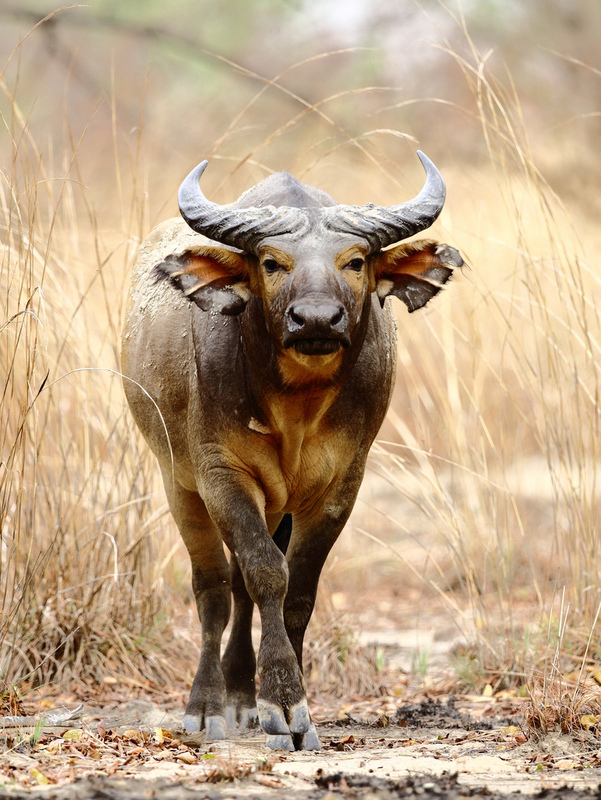 Having spent time around both, the Cape buffalo stands its ground gracefully and with presence. A true spectacle to witness first hand. You forgot a very simple distinction: Cape buffalo have their horns, which are shorter and not swept back over their shoulders, fused over the forehead in a boss. Water buffalo horns, *as clearly evident in your own photographs*, are not fused over the forehead and are swept back over the shoulders. They’re also usually much longer than Cape buffalo horns.